In a lot of ways it was exactly what Ottawa Redblacks kicker Lewis Ward had always wanted — to be on the sidelines during a Grey Cup game feeling the rush of a championship moment. And now he gets that chance on Sunday against the Calgary Stampeders. EDMONTON — In a lot of ways it was exactly what Lewis Ward had always wanted — to be on the sidelines during a Grey Cup game feeling the rush of a championship moment. Except, it wasn't how he had imagined it would be taking place. During last year's thrilling Grey Cup game in Ottawa, Ward was a security guard. He had picked up the gig during his time at the University of Ottawa as a way to help pay some bills. "I was on the field. I was so close to the action," Ward said. "I saw the interception by Toronto at the end of the game. I saw the fumble get returned back. I was actually on that sideline. I got to experience that as close as anyone could be." He watched the players in warmup. He dreamt about what it would be like to be preparing for the game like they all were. 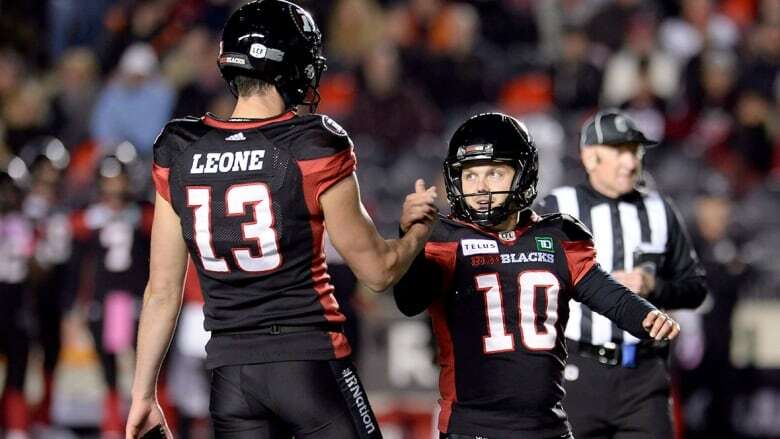 Now one year later, Ward is getting ready for the game, and will be back on the sidelines at a Grey Cup — this time though, he'll be doing what he does best, kicking field goals for the Ottawa Redblacks in the biggest game of his life. "I still have to pinch myself to believe this is all really happening," Ward said in preparation for Sunday's game against the Calgary Stampeders. From 2013 until the end of the 2017 season, Ward was the field goal kicker at the University of Ottawa. He finished his career with the Gee-Gees having made 89 consecutive field goals - the most in program and conference history and second-most in USports history. Despite his success, Ward went undrafted in the 2017 CFL draft. He went back to school for a fifth and final year before the Redblacks came knocking at the end of that football season. "We had watched his draft film and I had him graded as the highest-rated kicker," special teams coach Bob Dyce said. "We had worked him out. He did a great job. When we needed a new kicker, we brought him in." Ottawa's kicker Brett Maher headed south to the NFL, at the end of the 2017 season, opening up the door for Ward to shine. And he did. Ward was perfect on field goals in the pre-season and has never looked back. "I had that confidence that I was going to be successful if I got a shot," Ward said. "I consider myself a cool, calm, collected guy. I try not to let things faze me." Since making the move from university kicker to security guard, and now pro kicker, Ward has been nothing short of sensational. His rookie year in the CFL has been remarkable. His record-setting in the 2018 CFL season started early. During a game in late July, Ward tied an Ottawa football team record by kicking seven field goals in a game. 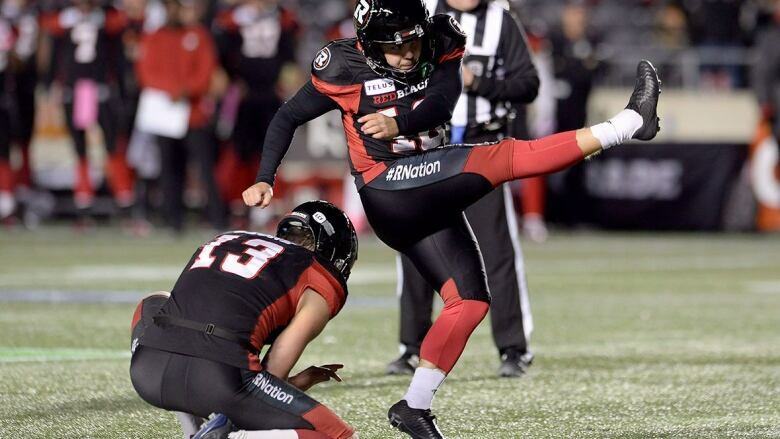 A couple of weeks later in August, he set a new CFL rookie record by kicking 22 consecutive field goals. Then in September, that streak continued when he set the all-time CFL single-season record by kicking his 33rd consecutive field goal. But the big record was still looming. 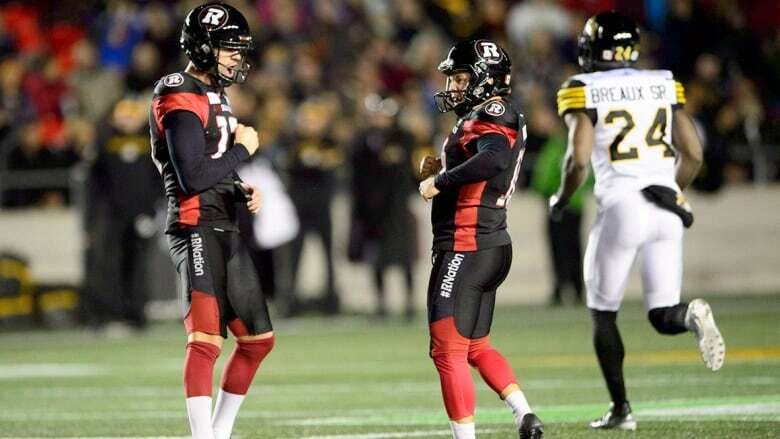 On Oct. 19 against the Hamilton Tiger-Cats, Ward broke the professional football record, breaking Adam Vinatieri's record from the NFL with his 45th straight field goal. "I honestly had no idea until it happened," Ward said with a grin. "My parents were in the crowd that day too. It was pretty special." Ward finished the season making 51 of 52 field goals. On Thursday night, Ward won both the CFL's Most Outstanding Rookie Award and Most Outstanding Special Teams Player Award. Ward was born and raised in England. He grew up there until his family moved to Kingston, Ont., just before he was beginning high school. Footy has always been a part of his family. Ward is a Liverpool fan while his dad roots for Birmingham — they have lively discussion over it. Ward played soccer growing up, naturally. "Since I was little, my dad said I could kick a soccer ball anywhere on the field and do what I wanted with it," Ward said. "I guess it's kind of paying off now." Ward says his parents are huge football fans now, attending nearly every home game in Ottawa and making some road trips for games throughout the season as well. They'll be at the game Sunday in Edmonton. The 26-year-old kicker is back on the sidelines, ready to run out on the field this time. He says should the game come down to a last-second field goal, he's prepared. "I would wish we were clearly winning the game but if that were the opportunity, then I need to take it. If that's the situation we're in, I'll do my best to make it happen," Ward said.